After a successful military career I retired to pursue business and environmental interests. I joined the 'Plastic Oceans Foundation' in 2009 where I worked as a science and sustainability adviser. I was also heavily involved in the production of the award winning documentary film 'A Plastic Ocean'. I founded the UK conservation organisation, Just One Ocean in 2013. As a speaker I have been fortunate to address audiences at numerous events around the world on a variety of aspects of ocean plastic pollution including the role of business and industry, changing value perception, the need for strategic solutions and the potential of citizen science. 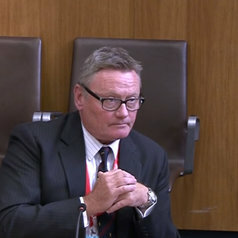 I most recently provided evidence on microplastics to the Climate Change, Environment and Rural Affairs Committee at the National Assembly for Wales. I have a BSc in Industry, a BA in Business and Management and an MSc in Coastal and Marine Resource Management. I am also a Fellow of the Royal Geographical Society and an Associate Member of the Institute of Civil Engineers. As well as being the CEO of the Just One Ocean charity I am currently undertaking postgraduate research at the University of Portsmouth. When I'm not talking passionately about ocean issues you will probably find me underwater with a camera.